Palaoeanthropologist Lee Berger, describer of Australopithecus sediba and professor at the University of the Witwatersrand in Johannesburg, can be heard here describing the recent Rising Star Expedition and the projects rescue of hominin bones from deep inside a cave in South Africa after a chance discovery by some cavers. The project, with support from the National Geographic and the Speleological Exploration Club of South Africa, have recently recovered around 1200 individual fossil hominin elements during a three week recovery dig at the site. As Berger discusses in the phenomenally exciting radio interview with National Geographic it his belief that there are articulated hominin remains yet to be uncovered and rescued from the cave site. It truly promises to be an amazing site due to the massive haul of fossil material found within a concentration no bigger then many dining room tables. Once the fossils have been analysed scientifically further information will be released, although the project is fairly unique in the fact that it is running as an open science project. The National Geographic (and others including John Hawks and Lee Berger) has so far done an excellent job in documenting the project (see here). In perhaps one of the most interesting periods ever for palaeoanthropological news the interview competes with the recent investigation of the five Homo erectus individuals at the Dmanisi site in Georgia and last week’s announcement of the sequencing of mtDNA from a 300,000 year old hominin from the Sima de los Huesos site in Spain (Meyer et al. 2013). I hope to further explore the 300,000 year old mtDNA article in detail in an upcoming entry. As ever, I heavily recommend heading over to John Hawks weblog as his posts on the Rising Star Expedition and human evolution continue to enthrall and shed light on the fossils and genetic investigations that he is so often a part of. We are living in some truly fascinating times where we are really starting to learn about human evolution through the glorious combination of genetic analysis and the smart approaches to extracting ancient DNA, combined with the truly amazing fossil finds of the past decade and a bit. Meyer, M., Fu, Q, Aximu-Petri, A., Glocke, I., Nickel, B., Arsuaga, J-L., Martínez, I., Gracia, A., Bermúdez de Castro, J .M., Carbonell, E & Pääbo, S. 2013. A Mitochondrial Genome Sequence of a Hominin from Sima de los Huesos. Nature. 505: 403-406. Guest post: ‘Thoughts from Amara West’ by Loretta Kilroe. Loretta Kilroe holds a research masters and a bachelors degree in Egyptology from the University of Oxford. Loretta’s specialism is the study of ancient Egyptian ceramics and post new kingdom ceramics specifically. The main focus of her research is the aim to approach ceramics from a social context with an eye to using changes in form and context to make inferences about society. Loretta is currently applying for PhD programs and can be found blogging at Cakes and Ceramics. Often I find, when I mention working in Sudan, people zip straight to thinking of war or corruption. In the UK, people tend to be surprised when I rave about the wonderful hospitality, the delicious food, the view of stars in the middle of the desert, and particularly the rich archaeological sites, bursting out of the country’s seams. When I finished my undergrad at Oxford, I was lucky enough to be invited to join the British Museum team in Amara West early this year, as an assistant ceramicist. At Oxford, most people studying Egyptology are linguists, but I found that getting to grips with pottery typologies was like another language in itself, and much more interesting in my opinion! 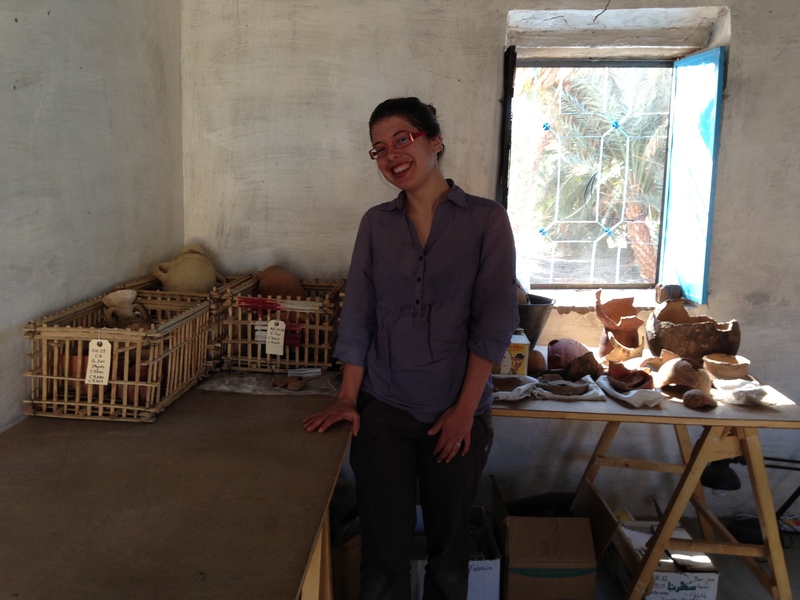 Loretta and a selection of the ceramics and pots excavated from the Amara West site in Sudan. Photography by Loretta Kilroe, property of the British Museum. Amara West is located just across the river from Abri, the largest town in the Nubian area, and just upriver from Sai, a famous site which inspired the development of the Kerma pottery typology. It is a late New Kingdom ‘colonial’ town, established by the Egyptians as part of their administration over Nubia, although the extent to which it was populated by Egyptians is debated. The British Museum excavation has been running since 2009, after a survey season from the British School in Rome, which identified key areas of the site. However the British Museum was not the first to discover the sand-coated town. Fairman excavated extensively with the Egypt Exploration Society in the 1920s and uncovered parts of the town and cemeteries as well as the Ramesside temple. The cemetery records are scanty however, especially since a few graves were only excavated to keep the workers occupied while finds were packed up for museums apparently! The BM’s research aims have steered in rather the opposite direction from this early work, and seek to find out what daily life was like in a town like this, instead of monumental architecture. And the dig has thrown up some beautifully touching examples of it: a treasured bracelet dropped on the ground and lost, yellow painted walls, a sealing in a house incredibly matching a scarab amulet found in one of the graves. The dig team live close to the site, on Ernetta island, 20 minutes boat ride downstream from the old town. The experience of living there, I found, significantly informed my understanding of the archaeology of the town. I know anthropologically-informed approaches have been growing in popularity in the archaeological community (with all its usual controversy), but coming from the land of sofas and fridges, it is 100% useful living with people who understand the climate and how to cope with it. 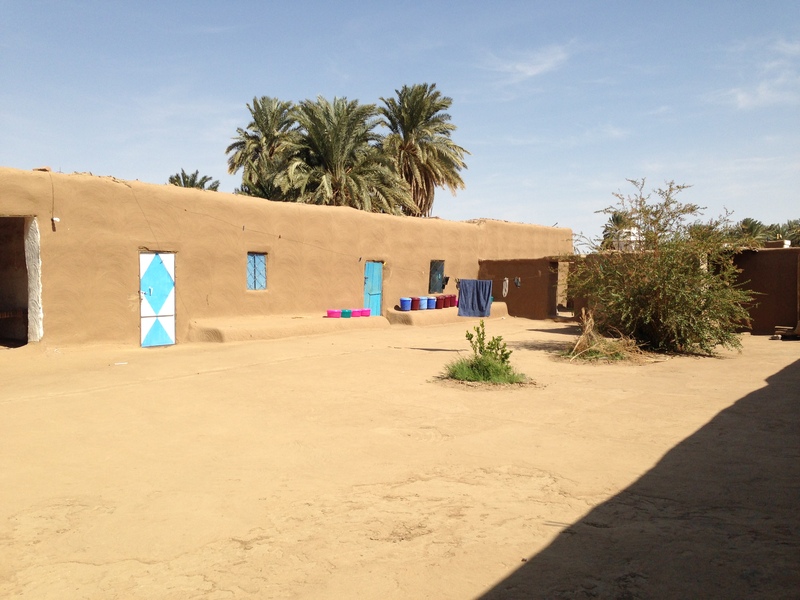 Thus mastabas (mud-brick benches against walls) which are outside all the houses in Ernetta, and in the courtyard, covered in a bright throw, are pretty much the same as those in the ancient Amara West houses. To keep water cool, it is kept in huge, porous ceramic pots, pretty similar to those we find in the sand. And the island is surrounded on its outskirts by date palms, which upon stepping out from, instantly leave you to the mercy of the sandy wind. 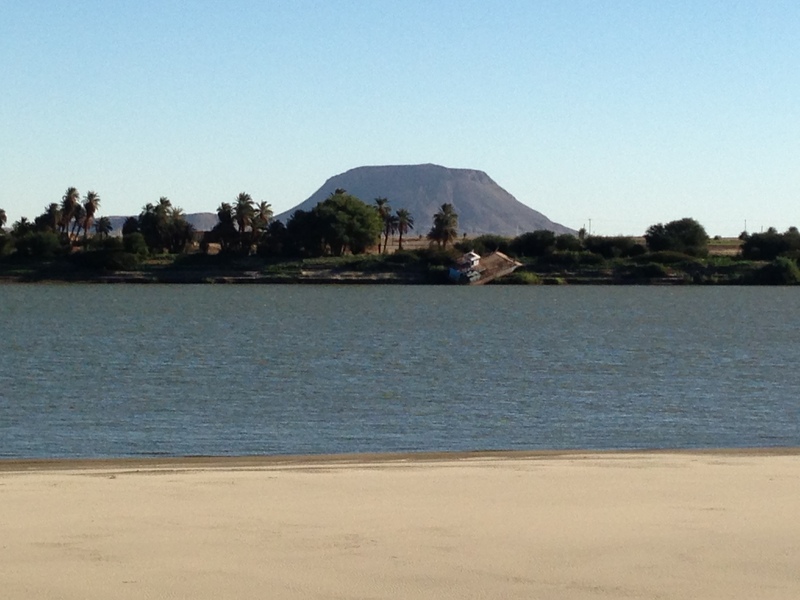 Recent evidence has suggested that Amara was once an island and when the Nile moved course, the inhabitants of the town had to start building barriers before their front doors to keep out the sand. The dig house, with the mastabas visible outside in the courtyard, resemble the buildings that were probably quite a common sight during the Amara West heyday. Photography by Loretta Kilroe, property belongs to the British Museum. One of the major questions dig members did keep talking about however, was how ancient inhabitants would have coped with the nimiti. If you work in Sudan, never mind the heat, the lack of electricity or the different food– little black flies known as nimiti will be the bane of your life. When the season gets hot, out they come in swarms, and crawl all over you all day in the sun. They bite, but luckily don’t carry any diseases this far north. It could get very irritating trying to draw a pot with nimiti crawling up into your armpit, and not being able to swipe them because the vessel was just in the right position! My personal theory is the cramped, smokey houses we think most people would have lived in, were perfect refuges against the flies who hate the dark and smoke. Now I applied for my research masters planning to study grave good groups, particularly ceramics, from the late Old Kingdom, to assess levels of state control in a time they were traditionally assumed to be weakening. So it is quite by accident that I ended up specialising in a period over 2000 years later, the Third Intermediate Period. I never found the later periods of Egyptian history compelling until I started looking at the pottery actually. In Sudan in particular, towards the end of the New Kingdom Egyptian-style pottery tends to get pretty ugly-which is what I absolutely love for some reason! The pottery in the town levels at Amara currently being excavated, dates through the Ramesside period. Pottery evidence in the villas built at some stage outside the town wall indicates these were built in the later Ramesside period, evidently at a time when there was thought no need for defenses. The problem arises when you approach the graves. Many of them date to the Ramesside and late Ramesside too, like the town; but some date to the Post New Kingdom (Third Intermediate Period in Egypt), a time when there are no occupation levels in the town. This is a conundrum which the research team, and my own research, try to address. A villa at the Amara West site in Sudan partially uncovered. Photograph by Loretta Kilroe, property of the British Museum. For the two month excavation period, I was responsible for the cemetery ceramics excavated from Cemetery C. The team alternate excavating between the two cemeteries on the site; D is located on an escarpment and was the ideal location for elite burial. The remains of a pyramid tomb was actually found by Fairman in this cemetery, and although all the graves have so far been looted in both cemeteries, enough broken material remains to piece together some idea of the wealth of this little community. The items in the graves also reflect a fascinating hybridisation of identity within the town, with artefacts from both the Nubian and the Egyptian cultural tradition often found side by side. Egyptian scarabs and painted coffin fragments have turned up, as have miraculous remains of woven baskets and eggshell jewellery. Post New-Kingdom/Third Intermediate Period pottery is understudied partially because this damage to contemporary occupation levels is quite common, so there are a lack of stratified deposits to learn from. However, in the case of Nubia, the decrease in variety as well as quality perceived has led to many interpretations of Nubian society as breaking up after the Egyptians left. The ceramics at this time are certainly very different from the blue-painted vessels and carefully formed jars of the 18th dynasty. Beer jars, one of the most common vessels in both cemetery and occupation levels, become so poorly made, they cannot even stand upright, and the bases are squashed by fingerprints. Red-rimmed bowls no longer have a neat little border, but the red quite literally dribbles everywhere. And by the time we get well into this pre-Napatan phase, pilgrim flask handles are stunted pieces of clay squashed onto the neck, useless for holding. 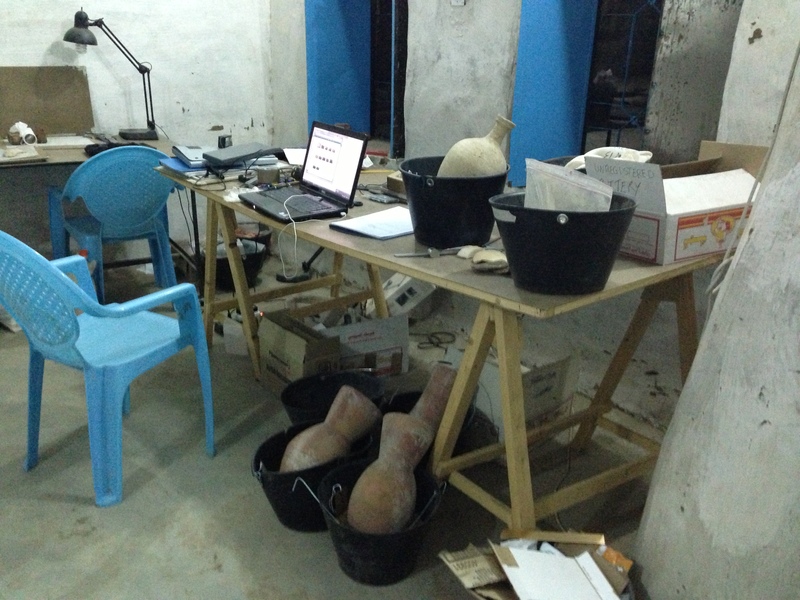 The desk and work station at the excavation, full of ceramics and pots ready to be described and analysed. Photograph by Loretta Kilroe, property of the British Museum. All these features are often dismissed as resulting from potters disinterest in aesthetics or the loss of technical knowledge as society broke down. However when I was in contact with examples of these vessels, I came to the conclusion that this view was distinctly limited. In Egyptology, ceramics are typically focused on in answering chronological questions, but my thesis sought to challenge these boundaries and discuss what social changes these ceramic shifts could indicate. The developments I suggested are too long to go into much detail here, but as a summary, I believe they reflect the changing purposes of these culturally Egyptian vessels when used by an increasingly hybridised society. Nubian pottery focuses much more on decoration than perfect wheel-thrown forms, and thus I believe the dribbly red rims become a deliberate aesthetic feature. A rare hybrid bowl lends support to this theory; hand-made and fired according to Nubian techniques, it was nonetheless shaped and coloured as a standard Egyptian bowl, indicating it was an imitation–and the red rim distinctly dribbles. At another site, Hillat el-Arab, later beer jars are replaced in graves by pilgrim flasks, suggesting that the reason beer jars could no longer stand up was because their use was obsolete. I hope to be talking about this development with red-rimmed bowls at the Current Research in Egyptology conference this April at UCL, so come along if you’re interested in finding out some more detail about what can, when summarised, sound like a bit of a crackpot theory! The Nile river, the lifeblood of Egypt and Sudan. Photograph taken by Loretta Kilroe. Research at Amara West is due to continue for the foreseeable future –a Collaborative Doctoral Scheme has just been awarded for a scholar to research the use of colour in New Kingdom towns with Amara as a significant case study– and there are still villas and graves to uncover. 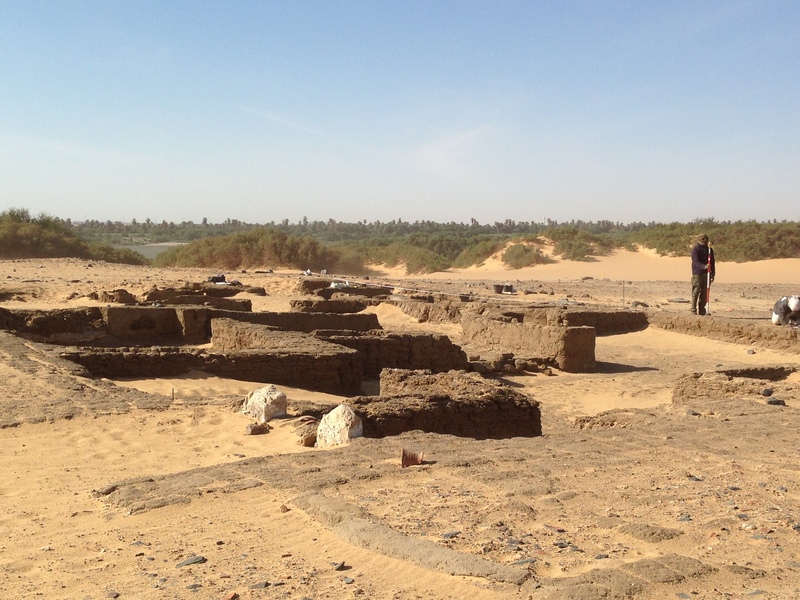 Together with the early New Kingdom site of Tombos further south, the increasing influx of archaeological projects in Sudan is shedding new light on how we understand New Kingdom expansion and the development of the later Napatan state. Meanwhile, I hope to return to Sudan one day in the near future–it is without a doubt the high point of places I have excavated! Learn more about the British Museum’s on-going project ‘Amara West: Investigating Life in an Egyptian Town‘. The 15th Current Research in Egyptology Conference takes place at King’s College London and University College London from the 9th to the 12th of April 2014. Aston, D. 1996. Egyptian Pottery of the Late New Kingdom and Third Intermediate Period. Tentative Footsteps in a Forbidding Terrain. Studien zur Archáologie und Geshichte Altágyptens 13. Heidelberg: Heidelberger Orientverlag. (An excellent typology for the Egyptian Third Intermediate Period). Bader, B. & Ownby, M. (eds.). 2009. Functional Aspects of Egyptian Ceramics in their Archaeological Context: Proceedings of a Conference held at the McDonald Institute for Archaeological Research, Cambridge, July 24th – July 25th, 2009. Leuven: Peeters. (One of the ceramic studies focusing on a social approach). Binder, M. Spencer, N. & Millet, M. 2010. ‘The New Kingdom Cemetery at Amara West’. Sudan and Nubia. 14: 25-44. Binder, M. Spencer, N. & Millet, M. 2011. ‘Cemetery D at Amara West: the Ramesside Period and its aftermath’. Sudan & Nubia. 16: 47-99. (Open Access). Spencer, N. 2009. ‘Cemeteries and a Ramesside Suburb at Amara West’. Sudan and Nubia. 13: 47–61. (All official British Museum team publications). Spencer, N. 2010. ‘Nubian architecture in an Egyptian town? Building E12.11 at Amara West’. Sudan and Nubia. 14: 15-24. Spencer, N., Woodward, J. & Macklin, M. 2012. ‘Re-assessing the Abandonment of Amara West: The Impact of a Changing Nile?‘. Sudan and Nubia. 16: 37-43. Spencer, N. 2013. ‘Insights into Life in Occupied Kush during the New Kingdom: New Research at Amara West‘. Antike Sudan. 23: 21–28. In the new BBC series ‘Rise of the Continents‘ Professor Iain Stewart discussed the origin of the African continent in the first episode, which aired on the 9th June and is available on the BBC Iplayer here, and nicely tied the opening episode with evolutionary history. Africa is rich in wildlife and geographical diversity, and it is, of course, the birthplace of our species, Homo sapiens. For me this program highlighted the importance of understanding geology and geography when considering the origin and evolution of animal life on earth (us included, of course). In particular the way in which the continents themselves effect evolution through the combined changes of the landscape, climate and geography, which are fundamentally altered through deep geological time as continents shift. This is important in considering the effects of both evolution on animal species (including the Homo lineage), and the impact of a changing landscape on human populations. On viewing the program (and becoming engrossed by the palaeontology), my immediate thoughts shifted to two massive geographical changes which impacted on European human and animal populations during the Mesolithic period. ‘Doggerland‘ is the modern name for the submerged landscape where now the North Sea sits in North-West Europe. However, up until around 5000 BC the area was dry land which helped connect the islands of the UK to mainland Europe, and the area, termed ‘Doggerland‘, was home to a variety of flora and faunal populations and home to hunter-gatherer humans societies (Gaffney et al. 2009). This was due to water being locked up in the form of ice during the last Ice Age which substantially lowered sea levels in the North Sea basin. However, from the Last Glacial Maximum (23,000 to roughly 13,000 BC) to the Late Glacial Maximum (11,000-8,000 BC) in the Northern Hemisphere, the environment changed and the sea level rose, eventually separating the modern day countries of the UK and Ireland from mainland Europe. On the other side of Europe another monumental landscape change was underway. The Black Sea, located in South Western Europe, has long been a focus of on-going palaeoclimate research (Siddall et al. 2004, Turney & Brown 2007; also see the UNESCO funded project ‘Caspian-Black Sea-Mediterranean Corridor during the last 30 ky: Sea Level Change and Human Adaptive Strategies‘). In particular it was unclear whether the Black Sea, with its highly fluctuating water levels, remained an isolate lake during the Late Glacial Maximum, or whether it remained connected to the world sea by the Bhosporus and Dardanelles straits. Studies and modelling (Siddall et al. 2004) suggest that the Black Sea water level was a lot lower during the Late Glacial Maximum, but following this period increased in water level and overall size. It’s important to reflect on the effect that these landscape changes would have had on prehistoric cultures. ‘Doggerland’ is well known for the amount of artefacts and animal bones that are dragged up by trawlers and other fishing vessels (Gaffney et al. 2009), whilst archaeologists have found prehistoric structures and artefacts in the flooded landscape of the Black Sea. In particular it marked a time of isolation for the islands of Britain and Ireland, which are reflected in the material culture following the separation. The Black Sea infilling proper likely caused human populations around the area to adapt and change their strategies in hunting and surviving. With the advent of agricultural in Europe during the Neolithic period (roughly 7000BC-1700BC), the trade and exchange of ideas, material cultural and people was no doubt influenced by changes in the landscape. The ‘Rise of the Continents’ series is well worth a watch, and I am particularly looking forward to future episodes in the series. Gaffney, V., Fitch, S. & Smith, D. 2009. Europe’s Lost Land: The Rediscovery of Doggerland. Council Of British Archaeology: York. Siddall, M., Pratt, L. J., Helfrich, K. R. & Giosan, L. 2004. Testing the Physical Oceanographic Implications of the Suggested Sudden Black Sea Infill 8400 Years Ago. Palaeoceanography. 19: 1-11. Turney, C. S. M. & Brown, H. 2007. Catastrophic Early Holocene Sea Level Rise, Human Migration, and the Neolithic Transition in Europe. Quaternary Science Reviews. 26 (17-18): 2036-2041.